Rajasthan has a tradition of building, and maintaining rainwater harvesting (RWH) structures such as johad, kuis, and kunds. Traditionally, these structures supported life in this water stressed region, and were well supported in turn by a system of community ownership. Excessive reliance on government run systems has led to the gradual neglect of these structures and disintegration of the entire support mechanism. The relevance of RWH in addressing today’s water crisis is unquestionable; however implementation models, design norms, and funding vary. The lack of financial models and capital limitations at the user end pose challenges in the rural individual context. In the urban setting, enforcement of RWH norms for large buildings has been a challenge. With the advancement of technology and increasing need for water new methods are adopted to conserve water using scientific techniques. In ravine lands, a series of small barriers are constructed across selected Nalla sections of second order streams so as to obstruct the flow of surface water in the stream channel and water is retained on the surface for a longer period. These check dams act as a mini percolation tank which helps retention of the silt load, supplement irrigation, contributes groundwater recharge and enhances the overall biomass production of the system. These Water harvesting dams are promoted under the Watershed Management Program in Rajasthan. In areas with irregular topography, flat bottomed, shallow and closely-spaced ditches or furrows there is maximum water contact area to recharge water from source stream or canal. This technique is less sensitive to silting. 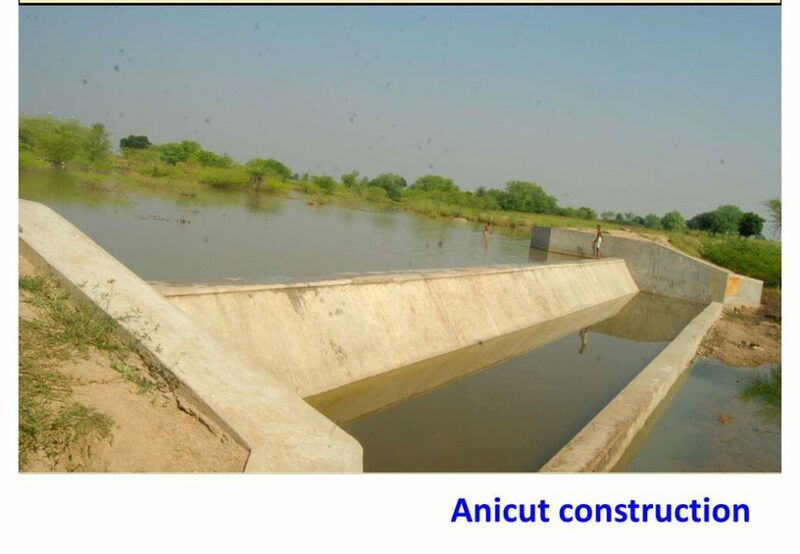 A small water harvesting masonry dam constructed across a stream to hold sufficient water and submerge the upstream area during the rainy season is known as an Anicut. The stored water is used for drinking and recharging groundwater in adjacent wells. Lift irrigation is also practiced. Like in a khadin, if the submerged area is large then bed cultivation is practiced using the stored soil profile moisture. Percolation tanks are recharge structures for impounding surface runoff constructed on small streams with adequate catchment. These tanks are more feasible in hard rock regions which are highly fractured and weathered to quickly recharge the groundwater due to low evaporation losses. They can be dug in alluvial rock formations as well. In the sandy bed of an ephemeral desert streams the sub-surface barrier is a suitable artificial recharge structure. It is constructed below the river bed on impermeable sub-surface strata and so the structure is secure from flooding and does not require periodic de-silting and has limited evaporation. Flash floods occur in response to very high rainfall or a cloudburst of short duration. Over-topping of defined courses of streams and spreading into flood plains causing immense damage are their characteristic features. These waters can be allowed to percolate inside the already existing aquifers of the water is diverted towards the run- off storage tanks. The water can be later put to agricultural or domestic purposes after basic purification. In-situ water harvesting and moisture conservation is very useful in drought mitigation and in enhancing land productivity, which are field based, cost effective, location-specific soil and water conservation technology. Under this technique, Contour furrowing is practiced on mild slopes. Also, a large numbers of mini-storages are created across the slope which alleviate drought. Contour bunding is recommended in the semiarid region of the state for soil and water conservation in rain-fed farming regions. Locally adapted, native, fast-growing perennial grasses with extensive root systems are planted against the slopes to act as Contour vegetative barrier. These grasses and shrubs form a dense hedge and conserve soil and water. This cheap and environmental friendly measure improves land productivity.